Another key game in the Eastern Kansas League will take place on Friday when Gardner-Edgerton travels to take on Blue Valley West. The Trailblazers and Jaguars remain in the thick of the EKL race as both are among five teams tied with one league loss. The two teams are coming off of very different performances a week ago. Gardner-Edgerton was impressive on offense in outscoring Bishop Miege 56-51. Senior running back Traevohn Wrench rushed for 343 yards and four touchdowns on 35 carries. He has now carried 99 times for 895 yards and 12 touchdowns this season. The Kansas commit has more than 5,700 rushing yards in his high school career. Quarterback Jared Hobby gives the Blazers’ offense balance. In his third season under center, Hobby has passed for 552 yards and eight scores through the first four games. His top receiving target has been Jaylon Radel who has 233 receiving yards and two scores. The Blazer defense may have some concerns after last week’s game with Miege, but then again Stag-quarterback Ryan Willis has put up big numbers against all opponents. He passed for 558 yards and six touchdowns against the Blazers last week on 64 attempts. Nick Wohlford and Seth Pesek lead the Blazer defense with 38 and 35 tackles, respectively. Blue Valley West will try and rebound from a 28-21 overtime loss to Blue Valley Northwest. The Jaguars came up short on 4th-and-goal at the 1-yard line and the Huskies connected on a 99-yard touchdown pass shortly after to lead 21-13. West quarterback Ryan Ralston scored a touchdown and two-point conversion to force overtime tied at 21, but the Jaguars could not answer Northwest’s overtime score. Ralston has thrown for 644 yards and five touchdowns, but has completed under 50 percent of his passes. John Reams leads Blue Valley West with 359 yards rushing and five scores, while Ralston has added 238 yards and five more touchdowns on the ground. Spencer Johannesman and Yousef Alagha are Ralston’s main receiving targets. Johannesman has caught 12 passes for 271 yards and two scores, while Alagha has 206 receiving yards and a touchdown among his 12 receptions. Gardner-Edgerton won last season’s match-up 27-20 to even the series at two games apiece since 2006. The Jaguars have been battling some injuries in the early season which isn’t a good formula when trying to outscore Wrench and the Blazers. Salina South had the big Week 1 victory against Derby before losing consecutive games to Maize (40-28) and Blue Valley (35-28). The Cougars rebounded with a 56-28 win against Haysville Campus last week. Salina South scored on the game’s first play, scored four times in the first quarter and had TDs on its first seven possessions. Salina South started to pull starters early in the second quarter and led 42-7 at halftime. Mike Jones finished with 11 carries for 110 yards and three scores. Hutchinson is without two of its top defenders in linebackers Colby Turner (shoulder) and Ryan Stoecklein (knee). Three sophomores and a junior filled those two spots against Newton. Hutchinson beat Newton 56-32 last week. Quarterback Turner Wintz and fullback Jacob Hardenburger lead the Salthawk offense. Wintz collected six touchdowns, had 310 rushing yards and 71 passing yards in last week’s victory. Hutchinson had 25 first downs and 571 rushing yards. Hardenburger rushed for 122 yards, but then missed most of the second half with a shoulder injury. Friday marks the first of five games in Salina for the South Cougars. Last season, South entered into Kansas’ elite with a 35-10 victory against Hutchinson. South was 0-10 against the Salthawks since 2004 before the meeting. On Friday, South continues to moves back up to elite status and wins at home against a banged up Hutchinson team. Columbus will travel to Abbey Field to take on Galena in a battle of unbeatens in the CNC League. The Titans and Bulldogs are among the three remaining CNC teams without a loss along with St. Mary’s Colgan. Bole has also been efficient in the passing game in throwing for 463 yards and five scores. His favorite target has been A.J. Randall (6-3, 205) who has 14 receptions for 288 yards and three scores. However the Titan defense is perhaps where the credit for the unbeaten start should rest. Columbus is surrendering less than seven points per game led by junior Taylor Watkins’ nearly nine tackles per game. That group should get tested by a Galena offense that has averaged nearly 42 points per contest. Junior running back Gabe Helton leads the Bulldog offense with 605 rushing yards and nine touchdowns on the season. Helton put up 220 yards and three scores in last week’s 43-14 win over Northeast-Arma. Quarterback Kyler Cook has kept opposing defenses honest by throwing for 585 yards and five scores. 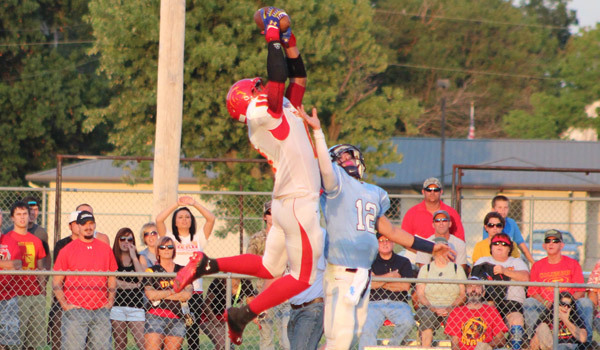 When Cook looks to the air, it is typically towards Logan Johnson or Aaron Cockerel who have combined for 19 receptions for nearly 330 yards. Both teams have endured early season tests, but come away victorious. Galena shutout Frontenac in the second half to win 28-14 back in Week 3, and Columbus got a 27-yard field goal from Justin Foust as time expired to win at Fort Scott, 15-14. Last season, the Titans won in Columbus 19-16. Expect another close contest again on Friday night. Conway Springs has continued to rank among the state’s elite teams with four victories by a combined score of 188-18. That includes a quality 21-6 victory against a strong Caney Valley team in Week 2. Last week, Conway Springs beat Cheney 35-6 and Dakota Finstad rushed for 162 yards and four scores. Before the victory, Cheney’s defense had permitted just two touchdowns. Since the series began in 2008, Conway Springs has won five straight against Trinity. None of the meetings are within 21 points, including a 45-14 victory last season. Tyler Burns, one of Kansas’ top juniors, has helped the Knights open 4-0 after back-to-back 4-5 seasons. Trinity hasn’t won more than five games since 2007 has never made the playoffs in school history, but has arguably the best team in program annals this fall. Last Friday, Burns rushed for 379 yards and six touchdowns, possibly the best performance in Trinity history, in a 47-26 victory against Garden Plain. In the second half, Burns scored on runs of 65, 61 and 63 yards. Trinity also blocked two punts, one for a score. Trinity had been 0-3 against Garden Plain prior to that game. Trinity will find out its true talent level against Conway Springs. Burns is the best player of the field – maybe the best Wichita player outside of Derby – but Conway Springs is a little stronger one through 11. Kiowa County has had plenty of talent the last couple of seasons, but has never been able to break through with a big year. That seems to have changed this fall behind all-stater Trever Powell. The Mavericks and South Central are two of the 10 undefeated teams left in Eight-Man, Division I. Kiowa County has outscored opponents 230-46 for the classification’s fourth-best offense and third-best defense. Powell, who led all Kansas eight-man players in interceptions last season, is a standout quarterback/defensive back. He has rushed 65 times for 878 yards and 13 scores and completed 4 of 9 passes for 90 yards and 3 TDs against no interceptions. Powell has picked off four passes and defended another. Powell has 13 interceptions, 201 tackles and 4,378 all-purpose yards in his career. South Central has outscored opponents 183-74 behind experienced quarterback Stetsen Underwood. He has rushed 84 times for 685 yards and 12 scores. Underwood has completed 13 of 26 for 151 yards and two scores against no interceptions. Kiowa County topped South Central 38-30 last season in district play. Powell is one of Kansas’ top eight-man players and the Mavericks have seemed to finally put it all together to make a state championship run. One of the state’s top matchups of the week will be played at a neutral site in Natoma. Hanover is north of Manhattan, while Sharon Springs is in Mountain Time. The two sets of Wildcats are more than 300 miles apart and will instead meet approximately half way. Hanover has two state championships and seven seasons of at least nine wins in the last eight years. Sharon Springs has one state title, three double-digit win seasons and has made the playoffs all seven seasons under coach Kevin Ayers. This is the first matchup between the two teams in the Ayers era. Senior quarterback Kyle Gfeller leads a strong and experienced Wallace County team with 143 passing yards, 253 rushing yards and 12 total touchdowns. The Wildcats already have forced nine turnovers, while senior Tyrell Springsteel has 7.5 sacks and Clay Schemm has six sacks. The Wildcats have outscored opponents 180-28 and rank third in Eight-Man, Division II in scoring defense. Sharon Springs has three shutout victories and a great 36-28 win against Hoxie in Week 2. Hanover ranks second in scoring defense and has outscored teams 148-22. No one has more than 251 rushing yards, but the Wildcats have averaged eight yards a rush with 15 rushing TDs. Senior quarterback Andrew Bruna has completed 14 of 30 passes for 306 yards with a 5/0 TD/INT ratio. Junior Ethan Fritschi paces Hanover with 16 tackles and a team-best three tackles for loss. This should be an outstanding matchup. Wallace County gets the edge, because special teams – Gfeller has kicked a field goal and three extra points – and a return game that already has a 69-yard and a 55-yard return. Gfeller has placed 21 of 26 kickoffs into the end zone. Hanover has six touchbacks on 20 kicks.